This title was first published in 1988: In this book the author has translated five postwar experimental Japanese plays and recreated the artistic, social and spiritual milieu in which they were created. 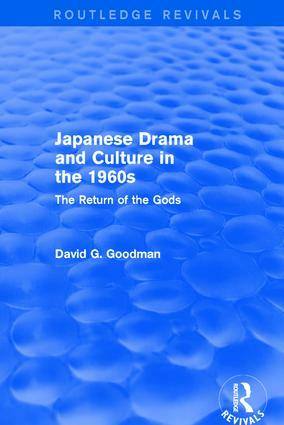 He describes the turning point in Japanese thinking about the nature and limitations of a Western-oriented modern culture, and the creation of "underground" theatres which in which evolved a new mythology of history. Professor Goodman sees these developments as an interplay between personal and political (ie revolutionary) salvation. The first biographical dictionary in any Western language devoted solely to Chinese women, Biographical Dictionary of Chinese Women is the product of years of research, translation, and writing by scores of China scholars from around the world. Volume II: Twentieth Century includes a far greater range of women than would have been previously possible because of the enormous amount of historical material and scholarly research that has become available recently. They include scientists, businesswomen, sportswomen, military officers, writers, scholars, revolutionary heroines, politicians, musicians, opera stars, film stars, artists, educators, nuns, and more.